SCPD: Suspect fleeing police in stolen vehicle struck another car. SCPD has arrested Nahriek Belford of Bellport 17, after he allegedly caused a fatal vehicle crash in Middle Island. Middle Island, NY - February 11, 2019 - Suffolk County Police Major Case detectives are investigating a two vehicle crash that killed three people and seriously injured two others on Route 25 in Middle Island on Saturday, February 9. 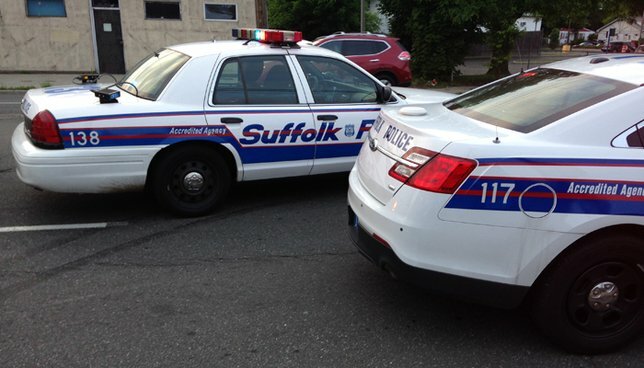 A Suffolk County Police officer observed a grey 2015 Nissan Rogue fail to stop at a stop sign and operating in a reckless manner on Main Street in Yaphank at approximately 11:45 p.m. The Nissan had been reported stolen on February 7, 2019 from Montauk Highway in East Patchogue. The officer attempted to initiate a traffic stop, but the driver fled from police in the Nissan. The officer followed the Nissan while radioing for back-up assistance. The Nissan, driven by Nahriek Belford, was travelling westbound on Route 25 when it struck a 2009 Honda CRV that was attempting to make a left turn onto Birchwood Park Drive at approximately 11:50 p.m. The driver and a passenger in the Honda, Jerome Weingarten, 74, and his wife, Randee Weingarten, 71, of Middle Island, and a 19-year-old passenger in the Nissan, Angelo Belford of Bellport, were pronounced dead at the scene by a physician assistant from the Office of the Suffolk County Medical Examiner. Their identities are being withheld pending notification of next of kin. Belford, and another passenger in the Nissan, were transported to Stony Brook University Hospital with serious, but non-life-threatening injuries. Belford, 17, of Bellport, was charged with one count of Reckless Endangerment. Additional charges are anticipated. He will be arraigned at a later date. Both vehicles were impounded for safety checks. The investigation is continuing. Detectives are asking anyone who may have witnessed the crash to contact the Major Case Unit at 631-852-6555 or anonymously to Crime Stoppers at 800-220-TIPS. Subject: LongIsland.com - Your Name sent you Article details of "Three People Killed, Two Seriously Injured in Middle Island Vehicle Crash, Officials Report"